Today, Google AdSense is the largest ad network with millions of publishers and advertisers globally. However, this does not mean that it is the most effective for monetizing your site. There are other ad networks out there willing to pay higher CPM for your site or posts’ traffic. One of the most reveled among the AdSense competitors is the Propeller ads. Propeller Ads uses CPM (cost per mile) which means the cost for every 1000 impressions that a site generates. AdSense was unmatched by any other network for years because of its extensive network and huge database. However, it has increasingly become difficult to predict income when using AdSense, and many publishers prefer alternatives that are more realistic and regular. What exactly is Propeller Ads? Propeller ads is a new network started in 2011 that promises higher CPM on 100% of every site traffic. Unlike the AdSense ad network, Propeller ads uses a CPM model that means payment is made for every 1000 impressions. Therefore, whether users are clicking the ads or not, you will get paid. It is because of this that many large publishers are opting for CPM in networks such as Propeller ads to CPC model used by Microsoft’s Bing and Google’s AdSense. If your site generates quality and stable traffic, CPM network such as Propeller Ads can guarantee regular daily and monthly income. It is because of this that you will get high traffic sites displaying content in several slides (at times up to 50) so that the number of views per page goes up. Propeller ads provide users with different products. This is what makes propeller ads a preference compared to others. This means that no matter the nature of your site, an ad product matching your products will be there. Notably, Propeller ads utilizes a unique algorithm that helps to identify fake traffic such as traffic exchange and autosurf among others. It is, therefore, critical to work extra hard using strategies such as content marketing and social media campaigns to drive higher traffic. This is of the most effective Propeller ads’ products. The product gives the highest CPM rate of up to $10. The product pays for every ad impression and can also be run on mobile devices. The ads are less invasive compared to the common pop-up ads that are often stopped with blockers in many computers and phones. They only appear as a site under (full-size browser window which is essentially like a landing page). This product is preferred by most entertainment websites dealing with content such as games, music, videos, viral content, and photos. With this product, you get paid for every visit, the CRM rates are higher, and they are very easy to integrate. Marketing on the mobile space is no longer an option for your company. With top search engines such as Google indicating that over 50% of the traffic comes from mobile phones, the potential to get a bigger market share is very high if you go mobile. Propeller ads has 2 categories of mobile ads; the Mobile Interstitial ads and Mobile dialogue ads. The mobile dialogue ads are run as special alerts that appear to users as a dialogue box. This raises the probability of getting the user attention that will ultimately elevate click-through-rates by CPM. Dialog Ads is a type of alert that appears to users as a dialogue box. As a result, the user is almost certain of attracting visitor attention that results in higher click-through-rate and thereby CPM. Mobile interstitial ads are full-screen mobile ads. Because they take a bigger a bigger space, the user is guaranteed of getting the target phone owner attention. They generate higher user engagement compared to other products. These are some of the most popular and easiest to target bigger audience at lower costs. Though the performance of classic banner ads is contested, the design and application in Propeller ads has given them a whole new meaning. The top performing banner ads by Propeller ads include units of 728×90 and 300×250. You could also opt for the 800×600, the 320×50, or 120×600 banner sizes. Remember also to check the best practices when using banner ads. Marketers refer to Layer ads as accelerated banner ads. They load faster on the website content and users can select any of the available banner units in Propeller ads. However, it needs to be a bigger unit such as the 800×440 or 800×600. This is another type of banner type of ad located at the bottom of web pages. It fades at the bottom of the page and remains visible unless the user decides to close it. Unlike other ads that show when one either scrolls to the bottom or show intent to exit, the slider ads are always visible. This increases the engagement and raises the click-through-rates. This is a special ad by Propeller ads that involves giving publishers a specific URL to market. A site owner can also promote the ad by creating own banners ads, buttons, redirects, or text links. One good example of utilizing this is by monetizing the 404 pages using a direct ad. In propeller ads, the direct ads yield more when used on download websites such as wallpapers, e-books, movies, music, and apps. For websites that want to monetize their video content, the best option is using Propeller video ads. This product is divided into three groups including Pre-game, Post-roll, mid-roll, and pre-roll. These ads run about 10 to 30 seconds in video advertisements especially at the beginning of the flash games and video content. Though not very attractive to publishers, they help to increase passive income from sites. To set up a Propeller ads account, the first step is signing up. You are required to signup a registration form using an email. The propeller ad system will activate the account and send a confirmation request. The process of confirmation will take about 24 hours. Notably, the system requires the publisher site to be content based as opposed to list of links. Besides, the site you use should be functional and not under construction or maintenance. The Propeller ad network, unlike others, does not have traffic minimum requirements. This means that even small and new sites can still join and make some cash from their traffic. The main restricted sites from Propeller ads include those that feature violence, adult content, scams, and objectionable content. To run a campaign in Propeller ads, you must select and add the right campaign URL for precise tracking by the network bots. You are also required to select the capping frequency, country, and advertising budget. To raise the chances of getting better results, Propeller ads allows users to target specific audiences. For example, if you are marketing an app that works on Android smartphone, the Propeller Ads allows you to filter Win mobiles, iPhones, iPads, or even all iOS. One major area that Propeller Ads score poorly is on testing and statistics. If you are looking forward to optimizing other things apart from conversion per zone, it is important to install a separate tracking system. What Propeller Ads provide is Test Budget Limits that allows users to set the cash they are willing to spend on a specific period. Here, if you have a bigger budget, a bigger number of combinations and placements will be tested. The network also has the Slice Limit that is related to the optimal number of impressions that a user wants to test for every zone. Using this limit, it is possible to set a cap on impressions that zones with huge volume will get. This is important to avoid such areas from consuming the entire budget and compromising the ability to test other zones. Propeller ads support can be rated slightly above average. The network has a vibrant support system that allows users to make inquiries on their accounts. The main form of communication is support tickets that users have to open and write their inquiries before submitting. The method is preferred because clients can follow the history of communication and follow-ups can be implemented with ease. The network also maintains an extensive knowledge database that provides answers to all questions that clients might have. It is particularly useful for newbies who are still finding the best foot to put forward when using Propeller ads. However, at a time when artificial intelligence has advanced so much, many users feel that Propeller ads should enhance the support services by including live chat. This would raise the overall engagement and attachment with its clients. At this point, it is prudent to draw a clear line between AdSense and Propeller ads because they closely define the associated benefits. AdSense as a pay-per-click network pays for every click that is achieved from your website. However, Propeller ads pay for every 1000 ad impressions. Propeller ads is very useful in generating revenue even for sites that have low-quality traffic but that report high page views to visit ratio. This makes it possible even for new companies and startups to make earnings from their traffic which could have been otherwise impossible with other alternatives such as AdSense. Because the Propeller Ads account is activated immediately, getting started is very easy. Besides, even operations are relatively easy. You simply log in and add all the domains of the sites you anticipate to monetize. Unlike other networks, the Propeller ad networks shares 80% of the generated revenue with its publishers. This is important in ensuring that site owners retain the bulk of the revenue for enhancing their products and marketing. The reporting system of Propeller Ad is very simplistic. You get the earnings on a chart of a table in real-time. This means that you can follow the performance of specific domains and establish when there is a need for urgent changes. To make your account operation easy and fun, propeller ads supports many payment methods including Webmoney, Payoneer, Wire Transfer, and Prepaid Cards. All the payments have a minimum payment of $100 except wire transfer that is set at $500. Besides, the payments are based on NET 30 terms (all money earned by the end of the month are paid after additional thirty days). As long as a website does not violate the Propeller Ad network rules, it will be allowed to run and cash channeled to your account. If you are a publisher in the Propeller ad network, there is an opportunity for earning 5% of all the future revenue. It is possible to monetize even the 404 pages so that there will be no wasted traffic. You can also optimize the returns by running parallel advertisements such as CJ, Infolinks, and AdSense. If you want special support to optimize traffic and returns, Propeller ads provides a dedicated account manager assistant. Propeller ads are often accused of poor user experience. Often, they feature full-screen ads and pop ups that are intrusive and very annoying. Notably, Propeller does not support PayPal. This is a great turn off for many publishers who are used to PayPal. It has also made it very difficult to rival AdSense because many publishers in the latter use PayPal. The minimum payout under Propeller Ads is on the higher side because of the methods used for payment. While Propeller Ads accepts all types of publisher sites, it might not be the best way to go for those looking to make a handsome income from high-quality traffic. 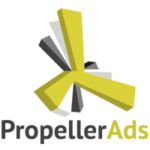 After years of looking for a great alternative to AdSense, Propeller Ads has come to fill the gap. It is more flexible and allows all sites including startups to make some earning from their traffic. Besides, they accept all sites as long as you do not violate their rules and regulations. Though a great alternative to AdSense, publishers should compare propeller ads well and weigh their targets appropriately to make the right option. Notably, if you have a small or large site that has not been making enough according to your expectations, it is advisable to try Propeller ads. However, experts recommend that you should also consider running parallel ad networks to capitalize on traffic from all angles and optimize revenue.